Plymouth Argyle midfielder Karl Duguid has signed a contract extension that will keep him at Home Park until the end of next season. 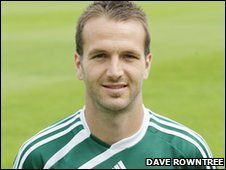 The 32-year-old, who joined the Pilgrims from Colchester in 2008, made 45 appearances for Plymouth last term. Duguid said the appointment of Peter Reid as the Pilgrims new boss was instrumental in his decision to stay. He said: "The manager's been named now and I think it's a great appointment. It is a good coup for the club." He added: "There were a lot of names in the frame before Peter's was mentioned and I immediately like the sound of that." The experienced midfielder also said he was excited by the prospect of returning to his old-club Colchester next season. "It will be nice to go back, see a few friends and, hopefully, get one over them."